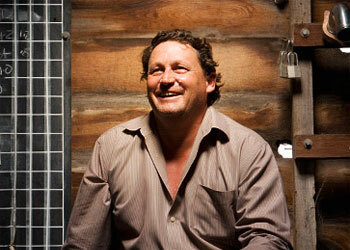 Self-taught winemaker David Powell is responsible for some of the most revered wines to come out of the Barossa Valley. Among the first English colonists to arrive in South Australia in 1836, Colonel William Light was tasked with seeking a north-eastern route to the Murray River, then the strategic artery of subsistence in the vastness of terra Australis. The first white man to venture into these parts, Light and his party turned back at Tanunda (an Aboriginal word for waterhole) Creek, the journey proving too perilous to continue. Paradoxically he named the environs the Barrosa or “Hill of Roses,” after a ridge in southern Spain commanding the entrance to Bermeja Peninsula. Light also named the southern extremity of the valley Lynedoch, after his commanding officer in the victorious battle against the French at the Barrosa in 1811. Early map draughtsman misspelt both names, with Barossa and Lyndoch remaining unchanged to this day. The Barossa terrain or terroir is still not without its challenges and, while the modern-day pioneers appear less intrepid than their indomitable ancestors, there are similarly arduous complexities to surviving in the ultra-competitive wine industry. One aspect the Barossa Valley is certainly not lacking in is charismatic personalities, none more so than the quixotic David Powell of Torbreck fame. Having completed his university education and groomed to follow in his father’s footsteps, a distinguished Adelaide corporate accountant, Powell liberated himself of this obligation and ended up in the far north of Scotland working as a lumberjack in a forest called Torbreck. Hence the name, along with sentimental localisms adorning the labels: Woodcutter’s Shiraz, The Steading, The Struie, The Factor, The Descendant, The Pict, The Bothie and his flagship wine, RunRig, aptly taking its name from a system of land distribution by ancient Scotsman. Some comparison to Colonel Light is befitting. Powell is a spirited and gritty individual, having fought his fair share of battles in building the Torbreck brand, inevitably making a few enemies in his pursuit of the best growers of old vine vineyards. However, no battle was fiercer than a particularly acrimonious and public divorce that nearly saw the business carved up by lawyers. While Powell’s ascendancy is sanctioned overseas, there is some local resentment. Unlike Americans, for example, who admire and are inspired by entrepreneurial achievers, Australians have a curious mannerism of “knocking” such success, or inherent “tall poppy syndrome”. Powell’s down-to-earth nature sees him unperturbed by such professional jealousy, although not afraid to call “a spade a spade” and frank in his rebuke. Powell is a self-taught winemaker, cutting his teeth at the synonymous Barossa winery Rockford, and then establishing Torbreck in 1994. Achieving a great deal in a relatively short time, his wines are revered around the world, snapped up on release and highly sought after on the secondary market at princely sums. Indeed, he holds the accolade for the highest amount paid to date for a bottle of Australian wine – US$70,000 (HK$546,000) at a Florida charity auction for a six-liter bottle of his Les Amis Grenache cuvee. Most of Powell’s wines are unorthodox to conventional Barossa style. As a self-declared Francophile and devotee of the Rhone Valley, he openly admits this greatly influences his wines. For instance, the Cuvee Juveniles, originally intended to be exclusive to the cult Parisian wine bar Juveniles, is fermented and matured entirely in stainless tanks. Shamelessly modelled on contemporary southern Rhone vignerons, this wine is reminiscent of my favorite Chateauneuf du Pape, Le Viex Donjon. The 2004 Juveniles (HK$345) is redolent of the mourvedre grape with aromas of cured meats, animal pelt, wild mushroom and dried herbs; a veritable provincial casserole. There is a pureness in the raspberry grenache fruit perfume with scents of lavender. It’s juicy and slippery on the palate with tangy raspberry fruit, dried herbs and clover spice; has suitable grip from grape skin and stalk tannins and a long farewell of zingy red berries and perky acidity. Incredibly drinkable, it has an ethereal Burgundy-meets-southern Rhone style and is appropriately sealed with a screwcap to ensure consistency. This is the way all Australian reds were produced up until the 1960s, when relying on low-yields, non- interventionist winemaking and minimal oak was the norm. These were days before drip irrigation and consequent over-cropping, bourbon-sweet American-oak barrels, oak-chips and synthetic tannins and additives were introduced by the domineering commercial wine companies. I applaud Powell’s adroit return to old methods. In the impeccable Torbreck range, The Descendant (HK$1,295) is supremely seductive, the paragon of shiraz-viognier blends in Australia. Those familiar with the celebrated E Guigal Cote Rotie La Mouline will assimilate the evocative merits of The Descendant with its six percent of co-fermented viognier. It is also a single vineyard wine owned by Powell (as distinct from fruit sourced from growers) planted in 1994 from cuttings off venerable RunRig vineyards – some of the oldest genetic vine material in Australia, if not the world. The 2003 Descendant, dense and inky-black, is a full-frontal charge on the olfactory senses: a mesmeric kaleidoscope of dried muscatels and figs, opulent port-like black fruits, beef stock, cloves and Oriental spices, pipe-tobacco, intriguing parmesan cheese nuances among exotic, tropical fruit scents and accentuated dried apricot. It is a huge mouthful of wine, plush and layered with sweet and sour black fruits, beef stew and charred-wood, cigar-box and mocha flavors, bound by fine tannins and satin texture; it’s expansive and spicy to the very end, with all-encompassing vibrant acidity. Settle back in your chair and indulge with a fine Cuban cigar. In my previous column I referred to the highest-pointed wine by Robert Parker in Australia, at the time, as being Veritas The Malcolm Shiraz (99/100). In fact, it was part of the Magpie Estate range, jointly made by Rolf Binder and English wine merchant Noel Young, the latter deserving an equally honorable mention. Unfortunately, the grower and source of this fruit was seduced elsewhere by higher prices, so Malcolm is now part of Magpie Estate history as is its enviable score, since Parker has announced a retreat from rating wines other than Bordeaux and Burgundy. Nevertheless, the 2004 Woodcutters Shiraz is mandatory drinking – bursting with blackberry essence among kalamata olive tapenade, black peppermill spice and dried herbs; it has a funky, earthy Garrigue-like character, resemblant of the south of France. The palate is gorgeously opulent with a lactose- creamy viscosity, penetrating crunchy blackberry fruit with some grilled meats and a zippy peppery finish. It’s hard to pick this as an Australian wine, looking more like a Croze-Hermitage, only better than I have ever seen from there. In the same vein as Juveniles, but matured in old foudres (large inert oak barrels that facilitate the desired oxidative characters) the Woodcutter’s Shiraz is most impressive, particularly when you consider he makes 20,000 cases of it. It’s unashamedly the “bread and butter” wine targeted at the strategic local price point A$19.95 (HK$119.75) per bottle . Unfortunately, the outstanding price-quality rapport does not quite translate in Hong Kong with the absurd 80 percent import duty, selling at HK$288.